Evolution Motorsports Silicone Boost Hose Kit PORSCHE - Dezod Motorsports Inc - Home of the automotive performance enthusiast since 2002. The Evolution Motorsports Silicone Boost Hose Kit will eliminate a common boost problem on the turbocharged Porsches. On most all modified Porsches the OEM boost hoses will leak and even blow out under acceleration leaving you with a loss in power and even stranded with a car that will not run. 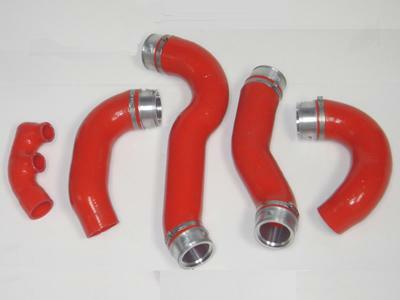 The OEM hoses are made from a rubber material that will deteriorate with a mass produced stamped aluminum end. This aluminum end does not secure properly into the intercoolers or “Y”-Pipe causing boost leaks and boost hose blow outs. The precisely machined billet ends are a perfect tolerance for the most secure fit. Our silicone is pressure tested to over 100 PSI which will not burst even under the most extreme conditions. REAL WORLD TESTED at over 30 PSI and 1000 HP! The Evolution Motorsports Silicone Boost Hose Kit comes as a complete bolt on kit.